Mouettes, or yellow shuttle boats, are Geneva's public transport boats operated on the Geneva Lake - Lac Léman, between 4 harbours in a city center. Mouettes provide convenient way for locals to cross the lake and very interesting and beautiful way to experience the Lake and see the Geneva from new perspective for tourist. Scroll down to learn about ticket prices. Yellow lake boats are modern and pretty quite with heating and comfortable, spacious, wooden interior. Having sitting space for 60 people, You can sit outside on the fresh air or inside behind the huge windows, from where You can enjoy the views on the lake and the city. Some eco-mouettes are powered by solar collectors. See the timetable bellow for times and routes of lake boats. 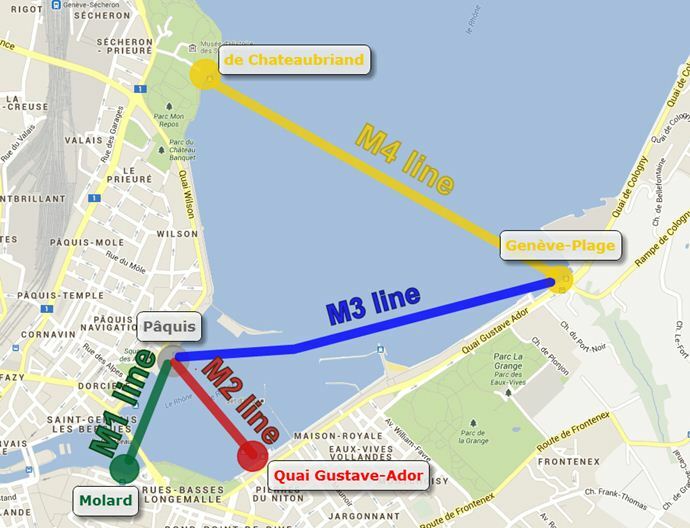 Mousettes are part of the Geneva Unireso Public Transport System, thus you need regular ticket (zone 10) to use them. Your monthly pass or free transport card from hotel will do, too.